We’d love your help. Let us know what’s wrong with this preview of Memory Prime by Judith Reeves-Stevens. To ask other readers questions about Memory Prime, please sign up. The Reeves-Stevenses have been among my favorite authors for a while, because of their works both within the Star Trek universe and outside of it. While this novel was good, it wasn't as amazing as I've come to expect from them. This book was okay. I found it hard to get through, but I have to give it points for pulling the wool so far over my eyes that I couldn't see the overarching plot until the big reveal at the end. I was disappointed with who the villain was, and the outcome of that, but conversely, was surprised as the resolution and its outcome. Another solid entry in the Star Trek original novel series. The authors developed a complex plot and expertly captured the essence of the relationship between Kirk, Spock and McCoy. I recommend it. So, I normally don't read Star Trek novels unless I have been assured that they are really very, very bad. So bad they're hilarious. That was not the case with this one. It ended up on my TBR pile through a series of coincidences. I picked it up at a used book store because I couldn't find anything else I wanted on the shelves, and I feel guilty leaving book stores without buying something. Especially used book stores. So I figured, well, my sister loves these old Star Trek novels, I'll just give So, I normally don't read Star Trek novels unless I have been assured that they are really very, very bad. So bad they're hilarious. That was not the case with this one. It ended up on my TBR pile through a series of coincidences. I picked it up at a used book store because I couldn't find anything else I wanted on the shelves, and I feel guilty leaving book stores without buying something. Especially used book stores. So I figured, well, my sister loves these old Star Trek novels, I'll just give it to her. Guess what. She already had it (though she had not yet read it.) Well, that's fine, I thought. I'll just give it to my friend who also loves these old Star Trek novels. Guess what. She already had it (though she had not yet read it.) So I acquired a Star Trek novel. And if I have a book, I have to read it. Anyhow, much to my surprise, the book was actually quite good! The authors got all of the characters EXACTLY right. And they obviously know their stuff and took great pains to ensconce this novel logically within the larger TOS universe. I also really appreciated the fact that they seemed to take pains to add more ladies wherever possible. And actually give them stuff to do! No damsels in distress in this book. Uhura is fab - I'm wondering if Zoe Saldana read this book at some point and used it to inform her depiction of Uhura in the 2009 Star Trek movie because I could not help picturing her. As for the plot, this book is essentially a sequel to "The Lights of Zetar", so if it's been a while you might want to rewatch that ep before reading. They do eventually summarize it, but not til chapter 10. I enjoyed the plot - I was able to predict most of it with the exception of a few details (ok, one admittedly rather large detail) which suits me fine. I like being a bit surprised. There is a love story, but it's done correctly - which is to say it barely registers at all and doesn't involve either Kirk or Spock (unless you count, you know, their own love story. Which I'm pretty sure the authors ship. I mean. I have page grabs. I will upload them later). Anyway this love story is just sort of there and the woman involved with it? Still hella useful despite having feelings for a man. Imagine that. All in all, a delightful surprise. I've died and woken up in a fanfic. 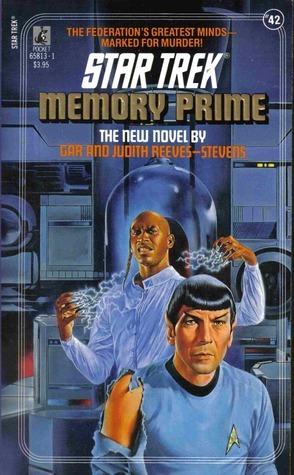 In this novel the Federation has created a number of "memory planets" which provide redundancy while also specialising in certain areas Memory Prime is a novel that draws upon the events from the original series episode "The Lights of Zetar" where Lieutenant Mira Romaine is taken over by an alien life form after Memory Alpha is wiped clean and it's personnel killed. The budding romance between her and Scotty is also built upon in the novel and these elements are the cornerstones of Memory Prime. The first of many contributions to "Star Trek" by the Reeves-Stevens writing team, and it's still one of their best. Once again, authors realize that the best way to combine science & action/adventure is to fill a story with fully realized, sympathetic characters, overflowing with development & realism. Throw in some nifty ideas about artificial intelligence, and some lovely future continuity touches to the (at the time, brand new) TNG universe, and the end result is another solid, engro The first of many contributions to "Star Trek" by the Reeves-Stevens writing team, and it's still one of their best. Once again, authors realize that the best way to combine science & action/adventure is to fill a story with fully realized, sympathetic characters, overflowing with development & realism. Throw in some nifty ideas about artificial intelligence, and some lovely future continuity touches to the (at the time, brand new) TNG universe, and the end result is another solid, engrossing thrill ride with Captain Kirk & his crew. This is my new favorite Star Trek book and I haven't said that for almost 7 years. Not only is it a great Star Trek book, but it is a great sci-fi book. I would totally buy in if this was set in a different universe with different characters. A good twisty mystery with a generous helping of humor and dash of romance. I will be buying this as a hardcover soon. Gar and Judy bring us another Star Trek book. Well, what can I say? I just didn't find it VERY enjoyable. I've read various Star Trek books, and it just seems like the TNG era is represented better in print. I felt that this was a good Star Trek novel. I liked that it kept to the world of the series and did not try to add too much extra lore to the Star Trek universe. I also found that that characters were faithful to the characterization from the television series. I felt that this book would have fit in nicely with the series and I believed that this adventure happened in the Star Trek Universe. This book had plenty of action and mystery to keep me interested. The klingon revisionist history of the nobel prizes is entertaining. Well, I am pleased to find that someone writing for the Star Trek books ha bothered to research their science enough to use it well with the story. This is the best one of those I've read that requires a good use of technical explanation. That may also be because it was outside my main field of biology primarily. Someone well versed in AI may find more flaws than I did. I have these TOS spirts but am determined to hold Lorra's last title until 2010, so picked something different to keep me going. Heavy on warp theory and, joy of joys, more Vulcan T'Pel-esk stuff. Very enjoyable to read, another one gobbled in a single sitting. The whole robot thing was a little contrived, perhaps - but a good yarn nonetheless. Really REALLY good Trek novel. The characters were very true to form, the plot was well conceived, and everyone was multi-dimensional. Just when it seemed like it was about to bog down, it picked itself up and slapped my across the face and told me to pay attention. A real rollercoaster of an adventure, and I ate up the dialog was like it was sugar. Veteran Trek writer: Winner. An interesting entry into the Star Trek (Original Series) pantheon. Written in the late 1980's, when personal computing was still a niche utilized by few, the language used by the authors to describe the computer network as w little difficult to correlate to current computer terms. Otherwise, it was an engaging read that holds the readers interest. I could not even finish this one. A complete bust. The plot was not well thought out at all. No need to waste time on it-I suppose when you have a book series that numbers in the nineties, you are going to run into a clunker now and then. A horrid cover, incorporating elements from the novel but bearing no real relation to any particular event in the story, didn't have me expecting much. However, this was one of the better Trek novels, with some interesting ideas as to the "universe" that future AIs might perceive. Probably not a good sign that even after reading the description of this book, I have no memory past the fact that I know I read it in college. There are a ga-zillion Trek books out there and unfortunately every few are that memorable. A favorite of ST:TOS. Very clever working of AI ideas. "Great Classic Star Trek fun with all our favorite characters. Interesting technical details about the Pathfinders. Satisfying ending with a few surprises." There's an evil computer, but that's about all I remember. Read a ton of these in high school and college and have no memory of almost 3/4 of them. 3 1/2 Stars ★★★ - A susprisingly solid little novel which I'd recommend to any classic Trek fanatic! This one just didn't do it for me. It took way to long to get to the point. When it finally did, it wasnt that great. I remember getting this from a used book store. It was a fun, light read, and the character's voices were true to the series. I'd recommend it for fans of the original series. I like my Star Trek, but this one didn't quite grab me.